We removed approximately 55,000 m3 of hard coral material to create the 500 metre long entrance channel. 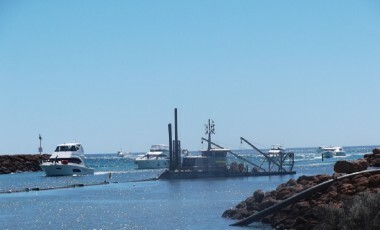 We also undertook clean-up dredging, as part of a Thiess consortium which constructed the harbour after the original contractor failed early in his effort and went broke. A later campaign included the removal of silts washed into the harbour during a 1:100 year flood event. 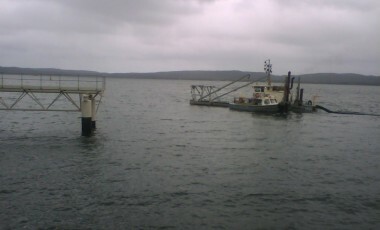 This involved dredging between piles and around cyclone moorings. 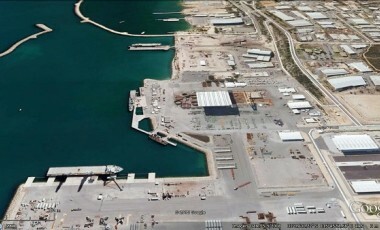 Yet another project involved removal of silt buildup from the harbour entrance and also leveling the rock floor of canals after failures occurred in another contractors levels while he was constructing the canals in difficult conditions. We were both the developers and the contractor for the whole development. This very large project involved peat stripping and filling the area by dredging approximately 2.0 million m3 of sand and 1.4 million m3 of peat. Thirty hectares of shallow lakes were created by dredging. 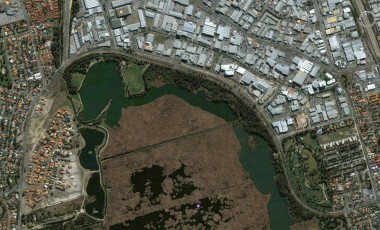 Up to 9 meters of peat depth stripped, which included substantial de-watering and earthworks. Our own earthmoving equipment was used, including all-terrain 6WD dump trucks, swamp dozers, swamp excavator, grader and loaders. Substantial solar drying techniques were employed. Difficult typhus reed removal was conducted by dredging, difficult engineering adaptation of dredges and dewatering plant to suit the extreme physical constraints and conditions in this 220 ha swamp site. Dredging was a 24hr x 6 day operation. We also put in the services and roads with the assistance of subcontractors. We were the construction contractors. 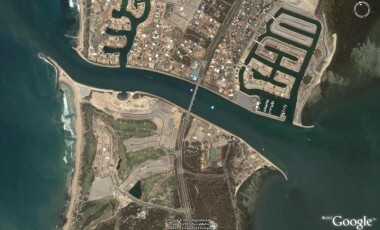 We dredged and dry excavated 520,000m3 sand to form the entrance channel and basin area to build this harbour. We produced, carted and placed limestone for revetments and for training groynes. We were the construction contractors. We dredged and dry excavated 510,000m3 sand to form the entrance channel and basin area. We produced, carted and placed granite rock for revetment and for training groynes. We also dredged approximately 30,000 metres of limestone reef from the entrance channel. We dredged approximately 100,000m3 of sand and silt from the harbour entrance and extended the harbour basin. We dredged along approximately 2.5 km of channels. Included were pumping distances of 1.8 km through a booster including 1.4 km of submerged line. We dredged approximately 40,000m3 of Swan River marsh material to create both the North and South Entrance channels to the Marina from the River. We dredged approximately 27,500m3 of material for the Albany Pilot Service Vessel Facility whilst it was being constructed by John Holland Group. We assisted Leighton Contractors in the dredging removal of a sea bund wall, prior to the tow out of the Concrete Gravity Structure. (We were called in to assist following another contractor having performance issues). The removal of approximately 20,000m3 of material from the entrance channel area while the groynes were still being built. In 2014 we dredged the footings for the groyne realignment and constructed the new entrance channel. We also undertook the sand and weed bypassing and re-configured the beach alignment to the east and west.